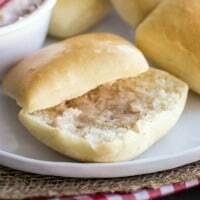 Delicious and soft homemade rolls that taste just like Texas Roadhouse Rolls! In the bottom of your stand mixer bowl, add yeast and 1 tsp sugar to ¼ cup warm water. Allow yeast to proof, or double in size, which takes about 5 minutes. Place milk in microwave for 45 seconds. Add the butter to the milk and stir until it is completely melted. Allow milk to cool until it is lukewarm. Once the yeast has doubled, add the milk to the yeast mixture. Add sugar and about half of the flour until it reaches a muffin batter. Let rest for 10 minutes. Add egg and salt to the mixture. Mix well. Add remaining flour to form a soft dough. Knead the dough until it is smooth and satiny. Cover and let rise until it doubles in size. Once it has doubled, punch the dough and let it rest for 10 minutes. Lightly flour a surface and roll the dough into a large rectangle, about a ½ inch thick. Cut the rectangle in half, and then cut each half into 6 square pieces with a pizza cutter. Place on a greased baking sheet and allow to rise until double in size. Bake at 350 for 10-15 minutes or until the tops are golden brown. 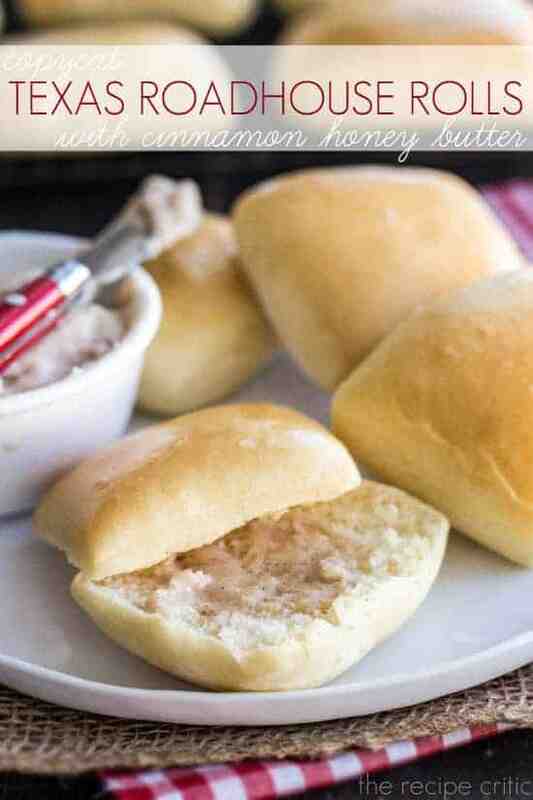 To make the honey butter, whip together butter, powdered sugar, honey, and cinnamon and serve on warm rolls. Those rolls look sooooo good 🙂 I just recently saw the light, when it comes to homebaking. It used to seem like a waste of time, but there’s really nothing better than freshly baked bread 🙂 PS. I love your website! I must make these!! I’m a sucker for bread! Has anyone made these and had good luck? I’ve never made homemade bread before and want to make these for Thanksgiving but don’t have a kitchenaid stand mixer….. These rolls looks really yummy! Love Texas Roadhouse rolls. 🙂 Also, what script font are you using on your site? For “Alyssa” and “About” in your menu? I love it! Way too much honey. The taste overwhelmed the spread and began separating immediately, Try 1 tbs per stick of butter to begin and add more to taste. How do you make the honey butter? How much of each ingredient? I cheated a bit an did on bread machine since with bad ankle no stairs an mixer was down cellar n i wanted to make. Making both and hoping I have good luck. But have made the butter before and LOVED it! What type of flour are you ladies using for this recipe? Plain or self rising??? It doesn’t specify, many thanks to you for sharing so many great recipes!!!! Have a blessed day. Has anyone made these and frozen before final rising? Breads and rolls are my comfort food. I will definitely try these soon. I have made sweet butter so it’s just getting the necessary ingredients out … and I will be good to go. Should really be a treat for my nursing student who comes home for Christmas break. Who doesn’t love a good hot roll with dinner. Or for breakfast, or for lunch. Maybe I should double the recipe.